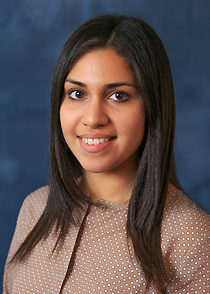 Elaime Hernandez, OD, FAAO is an assistant professor of Ophthalmology in the section of Optometry at Emory Eye Center and Grady Hospital. Dr. Hernandez’s emphasis is in primary care and ocular disease. She provides comprehensive eye exams including glasses and the management of ocular health. Dr. Hernandez is a Fellow of the American Academy of Optometry and a member of the Georgia and American Optometric Associations. Dr. Hernandez is recipient of the Robert Johnson’s Pediatric and Binocular Vision Award given by the National Optometric Association in 2013. • Conducting vision screenings in health fairs for Hispanic and underserved communities.